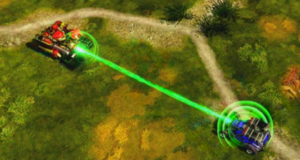 In this article, the realism of magnetism from Command & Conquer will be considered. Only the magnets used as “weapons” will be examined, conventional things like magnetic mines will not be covered here. 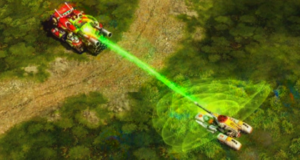 Yuri’s Magnetron in Red Alert 2: Yuri’s Revenge introduced the first magnetic weapon to the series, while the Soviets in Red Alert 3 expanded upon it. Technically, only the Hammer Tank’s Leech Beam or the Magnetron’s Magneshake attack against structures inflict direct damage against enemy forces, but all of the magnetic devices are still intended for offensive use and have the ability to harm opponents at least indirectly, so they will all be referred to as weapons in this article. Starting from the Magnetron, every magnetic weapon in Command & Conquer is actually quite similar. They all project a focused beam or field in a direct line of fire and none of them feature magnetic repulsion, only attraction. Since repulsion is only seen between two magnets or a diamagnetic object exposed to a very powerful magnetic field, this tends to make sense. While everything is technically diamagnetic by default, the attraction from the iron in vehicles would overwhelm any diamagnetism to the point of making it irrelevant. However, magnetic levitation also requires some sort of repulsion from the levitating object. If that object isn’t another magnet, it has to be diamagnetic. This creates an issue for the Magnetron, as it levitates its victims rather than just drag them as the Red Alert 3 Apocalypse does. Vehicles that can be attracted by a magnetic field wouldn’t levitate, and infantry, who would be diamagnetic, are unaffected by Magnetrons. Of course levitating an object should also require a minimum of three Magnetrons surrounding the object on all sides too. Water is also diamagnetic and should be repelled by a strong magnetic field, but is instead lifted by the Soviet’s Magnetic Satellite if it is used over a surface of water. The single biggest issue all of the magnetic weapons however, is their extremely directional nature. Magnetic fields cannot be isolated into beams, they are always circular flows. The only way the beam shapes seen in Command & Conquer could be formed is if they were actually full spherical fields that were suppressed in all but one, tiny direction with some sort of a counter-force. This concept creates new problems however, first the beam wouldn’t actually be a beam, taking on more of a cone shape, but this could also be used to explain their range limits. The bigger problem is that it would mean the unit itself would have to be resisting a magnetic force hundreds or thousands of times more powerful than the one concentrated area of the field it allowed through. If the strength of the rest of the sphere aside from the one beam that alone is powerful enough to lift or drag a tank from long range isn’t scary enough, then add to that the fact that magnetic fields follow an inverse-square law, where the strength of the field at a given range would be reduced to one-fourth at double that range, one-ninth at triple the range, one-sixteenth at quadruple the range, and so on. This means that if the hull of the emitting vehicle is around 20 cm (8 in) away from the source of the magnetic field, the magnetic force it felt would be one million times more powerful than the hull of a target tank 20 m (65 ft) away. At that level, a counter-force would be absolutely necessary just to prevent the vehicle from collapsing in on itself like a miniature black hole. The required strengths of these magnets are already beyond ridiculous, but when considering the strength of the Magnetic Satellite, it enters into the domain of true insanity. In order for the satellite to maintain a targeted beam for several seconds over a small area on the battlefield, it is likely the satellite would need to be in a geosynchronous orbit, where its orbit keeps it over the same part of the Earth throughout the day. This means it should be somewhere around 35,786 km (22,236 mi) above the Earth. Despite this vast distance, it can easily attract tanks and naval warships through the air and into space. The strength of a magnetic field is measured in teslas (T). An industrial lifting magnet, like those used in junk yards to lift cars, is about 1 T. An average medium-sized car weighs about 2250 kg (4960 lbs), while tanks can weigh upwards of 50,000 kg (110,000 lbs). However, the fully unlocked Ultra Magnetic Satellite can lift any vehicle, including super-heavy Apocalypse Tanks, Mobile Construction Vehicles, or Shogun Battleships. Measuring the weights of the ships in Red Alert 3 is difficult, as how much of their shrunken size is due to gameplay considerations versus intentional engineering is hard to say, but in the cinematic intro where Shogun Battleships can be seen alongside other units, the ships still appear quite small compared to historic battleships. Still, it seems we can safely assume the Ultra Magnetic Satellite is capable of lifting at least 2,000,000 kg (4,400,000 lbs) into space with ease. At those weights and that distance, the Ultra Magnetic Satellite seems to produce a magnetic field strength of more than 4×1019 T. Compare that to the current record for a sustained magnetic field of 45 T, or the most powerful magnetic fields detected in the universe originating from certain neutron stars known as magnetars with field strengths of up to 1011 T. At those strengths, even the electron clouds within atoms would be distorted. Who could say what manner of chaos that would wreak upon the Earth’s magnetic field, and we won’t even get into the energy required to activate such a satellite here. Another thing to consider is the attraction force between the source and target. Both objects should be pulled toward a point of balance between the two points of origin. 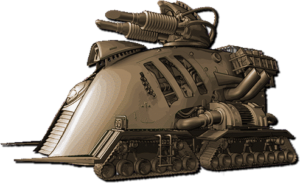 The Apocalypse Tank’s Magnetic Harpoon somewhat acknowledges this by having the tank dragged toward objects heavier than it, like King Onis, rather than the other way around. If it carefully controlled the strength of its magnetic field and maintained only enough power to get one object moving, this could be partially explained, but it is unlikely the heavier object wouldn’t at least dig itself into the terrain while resisting such force. What this means though, is that the Magnetic Satellite should be attracted downward with the same amount of magnetic force as its victims are attracted to upwards. With the addition of gravity to the equation, that would make it even harder for the satellite to keep itself from smashing into the Earth to moment it turns on its electromagnet.